Something I never anticipated when starting this blog was how exciting it would be to connect with people from all across the country. It’s like a little present each time I open my inbox to find a new message from someone I’ve met through this space. This weekend I found an email from the lovely Amber over at The Usual Bliss. 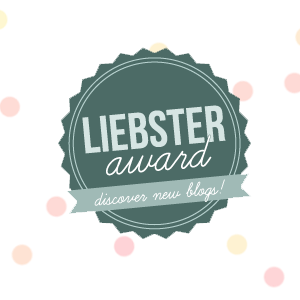 She was nominated by another blogger for The Liebster Blog Award. This award is given to new, or up-and-coming, bloggers who have less than 200 followers. The award is then passed along to other bloggers, in the same category, to help spread the word & support one another. How cool is that?! What’s even cooler? Amber passed the award onto me! What this award requires me to do is post 11 random facts about myself, and then nominate another group of up-and-coming blogs for you to check out. Since I hit my late 20’s, my hair and fingernails have started growing at an alarming rate. I recently got bangs, and am wondering if that was a tremendous mistake because they are only the right length for about 2 days. Manicures? Not worth the money for this girl. I have an undying love for putting twigs and tree branches in glass vases as decoration. I think I owe that credit to my Aunt Lisa. She has lived in various homes over the years, and she always creates warm and elegant spaces – often with found objects from nature. My purse is never without a bar of dark chocolate. My favorite brand is Theo, a company I fell head-over-heels for after touring their factory in Seattle a couple of years ago. I get downright giddy about ripping off and eating the nubby end of a french baguette. Lucky for me: there are two on each loaf! I love to take naps. I get cold very easily, so I don’t particularly enjoy being wet from head to toe. Swimming, getting out of the shower, running through the sprinkler… all of these things are met with various levels of trepidation. Every month or two, I get a huge craving for a hamburger or a roast beef sandwich. I take this as my body’s signal that I need a bit more protein or iron, and I indulge accordingly. I’ll take any excuse I can to wear red lipstick. I am almost a certified yoga instructor. I may never actually teach any yoga classes. I really enjoy wearing stripes. I have a weakness for gas station coffee, topped off with a smidge of the fake creamer. Please don’t judge me. Those of us who read blogs know this much about ourselves: we’re a curious bunch. It’s a treat and an honor to be allowed into the lives of others through these spaces. Amber’s interview was really fun, and provided a delightful way to feel like I got to know her better. Hopefully these little snippets about me helped you feel the same. A huge thank you to Amber for giving me a little shout-out. Be sure to check out her blog – you’ll fall in love with her honesty, silliness, fun photos, and so much more (warning: you may also want to take up permanent residence in the guest bedroom of her amazing mountain home!). Onto my suggestions for some wonderful blogs! Raw Milk Marathon: Jane is a seriously talented writer. The post about her in-laws? Knocked my socks off. But what I love most about Jane and her blog is the courage she brings in confronting the topics that are easy to shy-away from: having (or not having) babies, insecurities, faith, debt… she does it all. With grace and eloquence. Wowza. Miles and Laurel: Rebecca is one wildly motivated lady. She runs marathons, volunteers all around town, takes on loads of craft projects, has a sweet dog, and is getting married to her longtime honey this fall. Rebecca’s adventures are incredibly fun to read about, and her eternal optimism often feels like a dose of bright sunshine. Train. Compete. Finish. Repeat. : Kate is a runner who writes about her journey of getting back in the game of training for races. As a runner myself, I know how much of what we learn out on the streets/trails during training applies directly to life. Kate has just started her blog and I can’t wait to keep reading. Tell me: What do you look for in a blog? Honesty? Great photos? Recipes? We all read for different reasons – what’s yours? !